The Tutankhamun London exhibition includes information, housed in galleries, based on various themes including The Tomb. Comprehensive facts and information on The Tomb can be accessed by our sitemap. But this page details fast facts and info that we hope will 'wet your appetite' for Ancient Egyptian History and the Tutankhamun London Exhibition including The Tomb. Fact 3 The purpose of the tomb of King Tut was as a dwelling place called The Eternal House of the Dead. Fact 4 The tomb was constructed in such a way as to best promote the well-being, and ensure the preservation, of the dead pharaoh and his Ka, Ba and Ahk. Fact 5 The Ancient Egyptians provided for their afterlives according to their earthly means. When Tutankhamun died, his most most precious possessions were locked into his tomb to enable him to enjoy a wonderful existence in the afterlife. Fact 8 Each wall of the tomb has a specific theme. The East Wall depicts the Funeral Procession, the West Wall contains text from the Amduat, the South Wall depicts his arrival in the Underworld and the North Wall of the tomb shows the arrival of Tutankhamun in the Afterlife. Fact 9 The tomb of Tutankhamun contained four gilded shrines nested one inside the other in order of decreasing size. The innermost shrine contained the red quartzite sarcophagus of King Tut which protected three anthropoid, or man-shaped, coffins. Fact 10 The first two anthropoid coffins were made of gilded wood but the final coffin was made of solid gold. 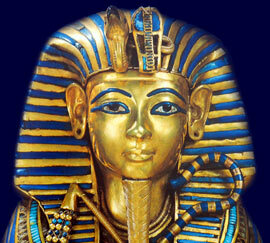 The solid gold coffin housed the mummy of King Tut which was directly covered by his fabulous golden death mask. Fact 14 The 'Treasury' was guarded by the magnificent statue of the god Anubis and contained jewel chests containing priceless jewelry, model boats and the golden shrine which contained the canopic jars which housed the internal organs of King Tut. Fact 16 No less than 143 separate items were wrapped with the mummy of King Tut. Each section of the King Tut website addresses all topics and provides interesting facts and information about the Golden Age of Pharaohs and of Egypt London Exhibition. The Sitemap provides full details of all of the information and facts provided about the fascinating subject of the Pharaoh Tutankhamun and the The Tomb.